Hello, lovelies. I'm pretty sure you're all familiar with exfoliating and how it is important for our skin. Yes, it helps remove the dead skin cells, hence making new room for the new skin to form. 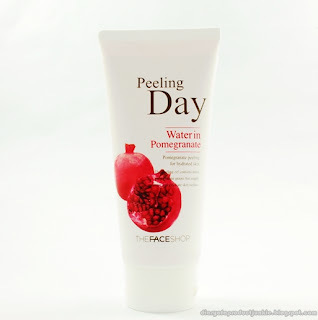 This time, I'm going to review the physical exolifator from The Face Shop. The white squeeze tube with a pomegranate on the label makes a common, yet refreshing look to the packaging. The pomegranate on the label certainly makes me feel like I wanted to take a bite out of it. The flip cap is convenient in dispensing the product. The product comes out as a clear gel consistency with small red beads. Once massaged on the face, the red beads disappear. Again, the scent is wonderful, I like it! It claims to remove dead skin cells and hydrates at the same time. After I've applied it all over my face, I begin to massage it. Not long after that, the clear gel turns into little balls, kinda like the eraser residue when you used an eraser to clean your pencil writing. However, it is gentle and non abrasive, so my skin doesn't get irritated too much. After rinsing the eraser-like-residue off my face and pat dry my face with a towel, I see the flaky, dry skin on my face is no longer noticeable. ini model nya kaya cure gitu ya? Any suggestion for oily skin peeling from The Face Shop or other brand? oooo i definitely will try this! 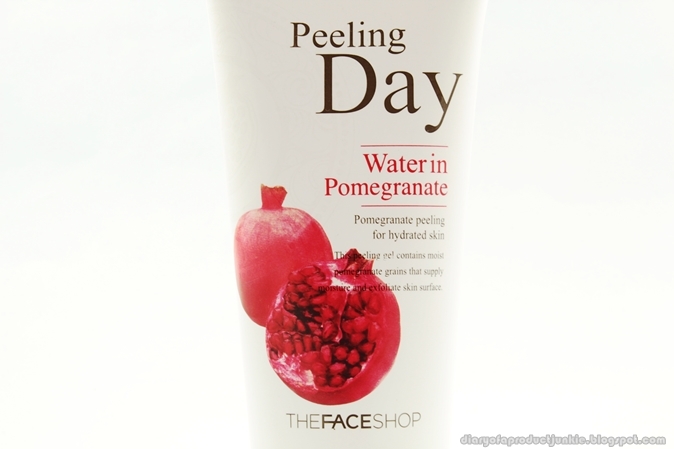 i love thefaceshop products! !